NYC’s (3/4 transplanted from Texas) Parquet Courts is a band featuring Andrew Savage of Fergus & Geronimo* and Austin Brown of The Keepsies**. 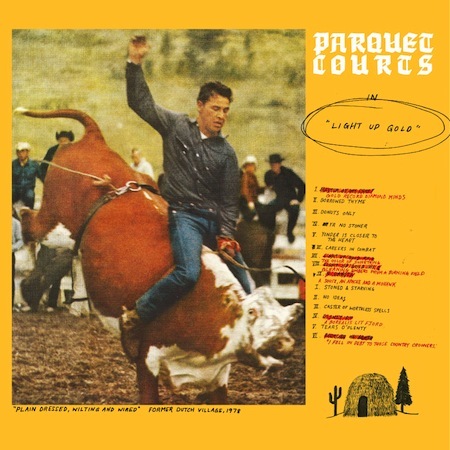 Well, earlier this year, Parquet Courts released their debut LP Light Up Gold via the Dull Tools label. Recorded over a few days in a ice-box practice space, Light Up Gold is the type of postpunky indie rock that frankly, I just can’t get enough of. This right here is track number two. You can purchase Light Up Gold in digital form @ dulltools.bandcamp.com or on vinyl @ dulltools.bigcartel.com. * Make sure you check out Fergus & Geronimo‘s recent mindfuck, Funky Was the State of Affairs. ** The Keepsies have a new 7″ coming out next month, more on that TK.